The Warriors of History - Samurai 1 oz Silver Coin begins this exciting new coin collection by New Zealand Mint. You can now buy your 1oz Silver Warriors of History Samurai coin from Kitco! This collection brings alive the stories of some of the most legendary warriors in history. This impressive first release features a colored illustration of a Samurai in full armor against an antique-finished, engraved background of a 'castle town' with Samurai soldiers lined up for battle. This high impact, colorful and partly-engraved 1oz silver coin comes presented in a sleek and stylish themed rectangular coin case, with textured cover. The uniquely numbered Certificate of Authenticity sits inside the coin case. The obverse features Queen Elizabeth II's portrait, and the reverse the image of the Samurai warrior. With a limited mintage of 5,000 coins, this Warriors of History - Samurai 1 oz Silver Coin would make an excellent gift for coin collectors and those interested in history. 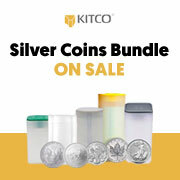 Buy your Samurai 1 oz Silver Coin from Kitco today!